PARIS --- Having made a mess of immigration, international trade, taxation and banking, the European Union is now looking to extend its reach to the field of defense, which until now has been able to escape from its clutches thanks to the belief that a nation’s defense is the main prerogative – and main duty – of national governments. In immigration, the EU has failed to control its external borders, despite having set up several agencies and ad-hoc organizations for this specific purpose. In international trade, it has dismantled all barriers and obstacles to imports, while negotiating no equivalent access to foreign markets for its own exporters as a counterpart. In taxation, it has attacked and black-listed foreign tax havens while ignoring its own, such as Luxemburg, Malta, the Isle of Man, Ireland, and the Netherlands, and so notably allowing Internet giants (Google, Amazon etc.) to pay virtually no taxes on the billions of euros of business they do within the European Union, and encouraging large multinational groups to locate their headquarters in the Netherlands to escape at least one level of corporate tax. By insisting that the two main Maastricht Criteria for financial stability (maximum 3% annual budget deficit, and public debt of less than 60% of GDP) be strictly enforced at the behest of Germany, the EU has impoverished Portugal, Spain and Greece, and threatened Italy’s financial stability, at the very time when the latter two countries have to cope with hundreds of thousands of Europe-bound immigrants and refugees, with precious little help from the richer EU members. All of these policies were perfected and enforced by senior European officials who would not qualify for top public employment in many advanced countries because of divided loyalties or conflicts of interest. Many of them worked for Goldman Sachs -- the bank that helped Greece fudge its national accounts to sneak into the euro zone – or, like Jean-Claude Juncker, the current President of the European Commission, negotiated corporate tax-avoidance schemes while he was Prime Minister of Luxembourg, his previous job. Alone, one particular absurdity of the European Union should suffice to keep it well away from defense: its incomprehensible willingness to hand over its rotating presidency to countries that are small and newly-independent, with no experience of an independent defense, or of large, international organizations. It is not an insult to observe that Malta, which held the rotating presidency for the first half of this year, or Estonia, which takes over on July 1 and will hand over to Bulgaria on Dec. 31, are not the most able EU members to guide the world’s second- or third-largest economic power, or to wield some authority over the Union’s 250 billion euro defense spending. Glossing over more of the its spectacular failures -- such as the Common Agricultural Policy or the Posted Workers Directive -- there are just four undisputed successes that the European Union can call its own, in its 60 years of existence. In no particular order, these are the Erasmus international student exchange program; the doubling of warranties on new cars; passport-free travel within the Schengen area; and the end of predatory mobile phone “roaming” charges within the EU’s 27 member countries. And this last one only came into effect on June 15, while this writer has been using mobiles phones – and thus paying those extortionate “roaming” changes – since 1994 – 23 years. All of the above provide ample reasons why, given its lackluster record in most fields except consumer rights, where it has truly made an appreciable difference, it makes little sense to broaden the European Union’s purview to include defense. But there are also other, convincing reasons for keeping the EU at arm’s length from defense. First of all, it has begun to preach for weapons rationalization by claiming that EU nations operate too many different types of weapons, and implying that, because the United States operates a single model of tank, the EU should do the same. To highlight the military irresponsibility of member nations, a Commission press release notes that “There are 17 different types of main battle tanks in the EU and only one in the US,” and that “For certain helicopter programmes, there are more helicopter types in Europe than governments able to buy them” to justify its intervention. Both of these claims are obviously false – can anyone name the 17 different in-service tanks, or find more than 28 in-service helicopter models? -- but they could sound convincing to the uninitiated. In fact, the helicopter claim is entirely spurious, as another EU background paper on defense claims “There are more helicopter producers (not helicopters produced) in Europe than there are governments able to buy them” But both are factually wrong, since there are only four helicopter producers in the Union, even if one generously includes two Polish firms, compared to 28 governments. Still, these mantras are kept alive to justify Brussels’ meddling in defense. Speaking of the Commission's proposals on defense at the European Council meeting of June 22-23, the EU’s Juncker said: "The proposal to create a Defence Fund is necessary — because in Europe we have 178 types of weapon systems, whereas the U.S. have 30. […] there is room for improvement and that is exactly what we decided today." In fact, wanting to rationalize by reducing the range of products is a stunning policy reversal for the EU, for which open competition is the cornerstone, the very first article of faith of its corporate philosophy. So why on earth should military staffs be barred from benefiting from the same free competition as civilian agencies when buying their kit, and be forced to buy a EU-approved tank if they prefer another? Intuitively, standardizing military equipment may make sense because it leads to a sharing of research and development costs, to longer production runs -- with, hopefully, lower unit prices –- and to pooled support and sustainment. Again, real-life experience tells an entirely different story from intellectual constructions. First of all, many nations want to keep sovereign control of their armed forces, which means controlling their equipment and resupply. Some may remember the 1982 Falklands War when Britain, finding itself short of ammunition, asked for access to Belgian stocks, and was rebuffed. Until and unless the EU 27 become one single nation, with a single government and a single set of integrated armed forces, no right-minded government can believe that a semi-failed, collective organization drowning in its own red tape could protect its borders more efficiently than it can itself. 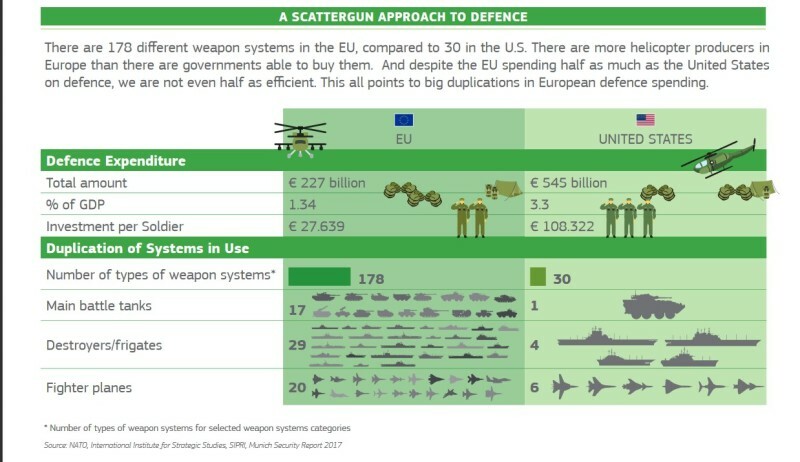 Like weapons rationalization, the EU’s latest initiative, its recently-approved Defense Fund, also sounds enticing at first: €500 million (gradually increasing to untold billions) made available each year for joint R&D initiatives and joint weapons programs. But, in fact, this is not fresh money: it is money that EU members pay as their annual membership dues, and which would then be returned to them after the EU has taken its cut to pay for its running expenses, and with all sorts of EU strings attached. All of a sudden, the reality sounds less enticing, and nations would do far better to keep their money, and spend it as they please, without going through the EU’s financial maws. But the EU Commission has stretched the truth, either directly or by relying on flawed analyses, to put some gloss on its grab for defense. The same here on the European Defence Fund claims, for example, thCommission paperThere is a strong economic case for greater cooperation on defence spending amongst EU countries. The lack of cooperation between Member States in the field of defence and security is estimated to cost annually between €25 billion and €100 billion.” The fact it can’t say whether it’s 25 billion or 100 billion shows that this is little more than a guesstimate. The same paper continues by saying that “80% of procurement and more than 90% of Research and Technology are run on a national basis,” and then makes a stunning claim: “Up to 30% of annual defence expenditures could be saved through pooling of procurement” – another “wet finger” guesstimate without any foundation in reality, given that while joint procurement has provided many advantages, lower prices are very rarely among them. The reality of international cooperation is that, when N number of nations get involved in a given weapon program, the cost to each is the square root of N, so a program with four partners will end up costing twice as much to each partner than would a national project. This rule of thumb, long used in the defense industry, is based on experience, not guesswork. Obviously, the pooling of funds through joint procurement can make expensive programs affordable for partner nations, and give them access to weapons they could not otherwise pay for. But this has always happened in post-war Europe, and without EU involvement. When France and Germany together developed the Tiger attack helicopter, and then with two more partners developed the NH90 medium helicopter, they first agreed to launch the programs on a bilateral basis, and then set up a joint pilot and ground crew training base, and have to some extent pooled their support. And when several European countries decided to develop the A400M, three of them agreed to pool their training efforts at Orléans, in France, while France, the UK and possibly Germany are discussing pooling their maintenance and support. The A400M also demonstrates how complex modern military systems have become, and its continuing technical and financial difficulties demonstrate how difficult it is to satisfy just seven countries. Alongside NATO’s Conference of National Armaments Directors, Europe has long has its own multilateral cooperation fora and agencies, for example the Independent European Project Group, which finally morphed into OCCAR, and which now manages many international programs on behalf of partner countries, from the French-Italian FREMM multipurpose frigate to the A400M transport aircraft. Consequently, there is little need for the EU to try to reinvent the wheel, and even less for it to try to force an additional lever of bureaucracy to enforce a level of joint procurement that nations neither need nor want. There are two more convincing arguments to keep the EU at arm’s length. The first is that by producing its own weapons as and how it wants, and exporting them according to its own policies, rules and inclinations, each country supports its national industry to the degree it decides is necessary. Furthermore, much of what a nation spends on developing, producing and supporting its own weapons, to its own requirements, it recovers in terms of value-added tax, payroll taxes and company tax. Chipping in a few million euros to share in developing a weapon system and then buying it off-the-shelf from another EU country would certainly be cheaper, but would provide no comparable sovereign, technological, employment or fiscal advantages. And one can easily imagine that defense exports – worth billions of euros each year to Britain, France, Germany and Italy – would wither as soon as an organization of 27-countries, each with its own arms export rules, foreign policy goals and economic interests, got involved in their management. The second argument is that the diversity of EU member’s geographical environments, and the military operations nations undertake, require different pieces of equipment. Operating a helicopter in summertime Greece or in wintertime Sweden requires different performance, while anti-submarine operations in the Gulf of Finland or in the North Atlantic cannot be conducted using the same type of ship. But there is one thing that would immeasurably improve European defense and security, as well as the economic health of its members: excluding defense spending, or a large portion thereof, from the Maastricht ceilings. Originally, these ceilings were demanded by Germany to prevent spendthrift European nations from going on spending binges, but there has never been, nor will there ever be, a defense spending binge, because popular opinion would immediately block it. But, especially in today’s current threat-rich strategic environment, excluding defense spending from the 3% budget deficit cap and the 60% debt cap would immediately improve military readiness by allowing nations to invest without risking retribution from the EU Commission. That is the only thing the EU needs to do to strengthen European defense; the second thing is to keep well away. Excluding defense from the spending caps is a simple, cheap and effective solution to a very real problem: just what the EU should have always been.